I don't need defending. I don't consider it "me" against anyone. Conversations about race always seem to bring out well-meaning allies. Now, while I am a firm believer that change cannot be brought about without the help of people in privileged positions in society, there are always the few that use their ally-ship to boost their privilege instead of leveling it. If you’ve ever wondered if you’re crazy for not wanting help from a well-meaning person… or even if as a self-professed ally you’ve ever wondered whether you’re helping or hindering, here’s a few ways to spot (if you’re) a fake ally. Watch their reaction when the “marginalized” person they’re defending earns or receives something normally allotted to an ally due to privilege. This is especially useful if you ever wondered if you are the “token” in a friendship dynamic. Get the guy, get the job, get the guy, get the compliment, GET THE GUY.. and watch all of the saccharine dissolve into a puddle of venom specifically pointed at what used to be “all” of your lives mattering. Bonus points if you’re “ally” gets their point across with sarcasm or humor (“shoot, if they can find love we ALL have a shot!”). Critique a problematic act of “ally-ship”. Fake allies revel in the appearance of being without flaw due to their self-appointed ally sainthood. If you ever point to their help actually being a hindrance, note their fury. Usually it’s something along the lines of “after all I’ve done for you people” and involves them retracting their assistance. Just ask Bernie supporters. Or, of course, #NotAlllMen. Try, at any point, to retrieve the conversation back from their attempt to center it around themselves. Have you ever started to discuss an incident of say, a micro-aggression with an “ally”, only to watch the conversation disintegrate into a therapy session for how it made THEM feel? Try to interrupt it. It usually turns into this. Or this. Or this. Or, goodness, THIS. Watch how they react to you having the audacity to define your experience. One of the most insidious ways privilege rears its ugly head is when others believe they are able to define you or speak to your experience better than you, the person actually living it, can. Take Leslie Jones of SNL-fame. She has spent her entire time in the industry not being the “right” kind of tall, the “right” kind of plus-size, the “right” type of ethnically beautiful. However, she has repeatedly come under fire for doing what most comedians do and basing her routines around her lived experiences-because of the fact that her ACTUAL lived experiences also happen to be the punchline of a lot of cheap jokes about Black Women. Or take all the voices yelling over Viola Davis whenever she tries to explain what being “not classically beautiful” in Hollywood is like. Or when a woman dares to be fine with calling herself fat. It is impossible to be of any assistance as an ally if you want everything that makes you uncomfortable about someone else’s lived experience to just disappear. Call it whatever you want, but if you feel in order to help someone you need to always stand in front and speak first, you can’t really call it helping. And if you find yourself angry after reading this post, well….maybe you’re not the ally you thought you were. What about you? Have you ever had to check a fake ally? As March begins, and we transition from an eventful Black History Month (Formation, anyone?) to Women’s History Month, I wanted to take a quick look back at a few things that sat on my spirit. Namely, the attention that has been brought to “anti-blackness” in Latin America, particularly from those of Afro-Latinx descent. Afro-Latinx, as a term, is brand-spanking new. However, Blackness in Latin America is not. Latinxs-to the eyes of the outside world-are relatively “new” at “showcasing” the diverse faces of Latinidad, and having distinct terms to describe it. This does not mean we are new to our Blackness. It means we are new to describing it the way you do. There is a very rich Afro-Indigenous history in Latin America that many would know of if it weren’t for the pesky fact that the only time they pay attention to our Blackness is to self-righteously chastise us for “anti-Blackness”. “I no Black, Papi”, indeed. Latinxs are a nationalistic bunch and tend to identify culturally first, much like you do..
You just happen to call that culture “Black”. To that point, much of what you consider anti-Black sentiment in the Latinx community belongs to a much larger conversation on anti-American sentiment (and African-American in relation to Blacks of other countries, for that matter), because “Black” has for so long been synonymous with “African American”. This is how you can say someone isn’t “Black enough” and when asked to expound cultural descriptors come out, such as movies, food or music. Your challenges with colorism differ from ours- because where we are from many more of us are considered “dark”. I didn’t identify as a light-skinned Black woman until well into adulthood; even though I considered myself Black, I identified as a Dark Latina. Many of the biases you identify as solely being of “dark girls” I have also experienced and can identify with within my culture, because “Spaniard” (read: lily white) is default, everything else is “dark”. Yes, there absolutely are levels to anti-Blackness within Latin America, and yes outright denial of African ancestry by some exists; yes colorism and favoritism based on varying degrees of skin-tone and hair grade exist. But many negative biases attributed to being dark-skinned can also be found within the context of being a “dark Latina”. Erasure, teasing, the desire and attempt to lighten skin and “tame” hair, wondering what life would be like if you didn’t look like that or your parents “bred up”, wondering if you’d ever see someone that looked like you on tv, not having makeup available in your shade, being “____for a dark-skinned girl”, being a guy’s charity case in dating… why do you think darker Latinas even started dating Black American men here? Do you really think Latin America would be home to some of the most advanced techniques in skin bleaching and hair straightening if it was only meant to “fix” the most ethnically dark in our bunch? We are acutely aware the institution of racism in America uses Afro-Latinxs as proof of “progressiveness in diversity” at the exclusion of African Americans. We also need jobs. Amongst people of color, Afro and Indigenous Hispanics enjoy both the lowest median income and the lowest education level OF LATINXS, who already have the largest pay gap in comparison to their white counterparts. Asking a Latinx to step aside in a job opportunity, as opposed to directly challenging the institution that put them in that predicament, just doesn’t make a whole lot of sense to me. But while we are on the subject, it should be pointed out that similarly, the institution of racism also uses peoples of the countries of Africa, non-Hispanic Afro-Caribbeans, Black Brits and others, especially in entertainment, to make the same statement of “progressive diversity”. Eliminating anti-Black sentiment as a whole-and anti- African American sentiment specifically-cannot be the responsibility of those whom you consider to be the “most privileged” among you-because we are all STILL considered “non-white”, which means that privilege is contingent upon the “favor” of an institution that takes great pride in reminding us of our “place” in society. The truth is, I’m tired. Standing at an intersection means your work is added upon exponentially by whatever roads you cross, be them cultural, racial, orientation, gender, size or disability. And I do not know where we go from here. But I do know if I have taken the time to learn history and gain some understanding before I speak on things, it isn’t a lot to ask if others do the same. And maybe one day we will finally understand we’re all in this together, after all. *Author’s Note- I very specifically did not refer to Zoe Saldana in this post because this is an issue much bigger than she, and I did not want to “date” this post with the reference. But if you believe she does not consider herself to be Black you are welcome to click here. Also, understand that whatever backlash she is receiving for her current projects is tame compared to the racist backlash she got for “Colombiana”. And honestly, after being subjected to over a decade in the industry of being forced to discuss race and ethnicity, I can’t say I would or wouldn’t have done what she did and opt out (as clumsily as she may have) from discussing it altogether. Again, before you defend or deride…try to understand. Out & About; BLF Celebrates Tweezerman’s 35th Anniversary! While BLF normally is seen at our favorite fashion events, we had the honor of being invited to celebrate the 35th anniversary of beauty-pro darling Tweezerman! Makeup artists and bloggers, as well as select media and retail partners, gathered at the Chester in Meatpacking to sip and sample Tweezerman’s signature beauty products. Currently enjoying sips and beauty tips at the #TweezermanTurns35 event! Tweezerman started 35 years ago with a single product- the Splintertweeze. Their iconic original product-a best-seller for its precision tips and famous “Tweezerman Slant”- became a launching pad for the brand, which branched into providing head to toe beauty tools for celebrities, makeup artists, and those like us who just want to look like a million bucks. In celebration, Tweezerman offered guests a showcase of their most popular items-which we were invited to try for ourselves by filling our own pro-makeup pouch- while ambassadors were on-hand to give us info and tips on how to make the most of their beauty tools. Guests also had the opportunity to win great prizes like an iPad mini, gift certificates and a trip to Las Vegas! While I was familiar with their tweezing products, I was excited to learn that tweezerman has products for the total eye, ranging from eyelash curlers to makeup brushes! Because you know I love a smoky eye, my fave product of the evening was the Brush IQ eye defining kit. Consisting of the line glider, shader and blender brushes, the Brush IQ series features DuPont Natrafil patented technology which performs like animal hair fibers while being more hygienic (hello, sensitive skin solutions!). The brushes can be used with wet or dry makeup. Check out the tutorial below and let us know, have you tried any of the Tweezerman or Brush IQ products? 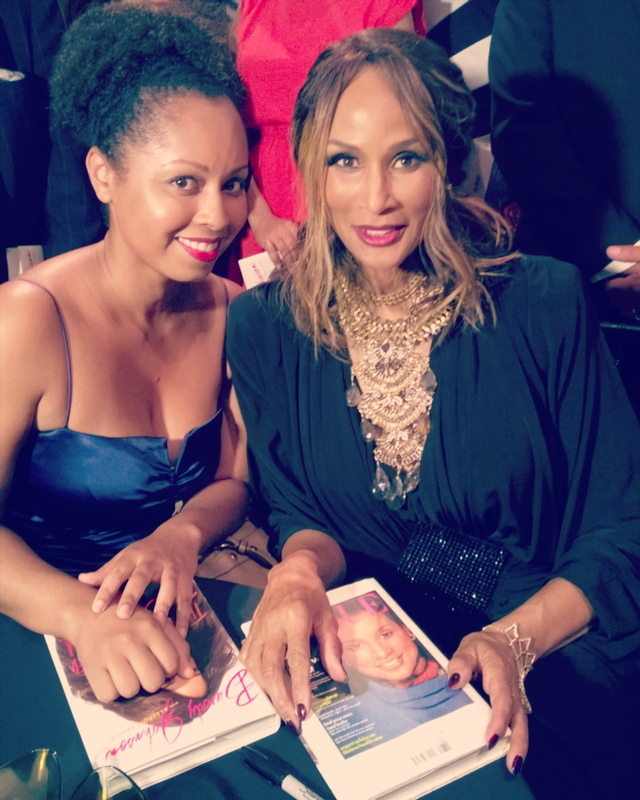 BLF does NYFW- Beverly Johnson and The Face that Changed it All! Ok, now THIS is how you kick off Fashion Week! You are not allowed to make fun of my fangirling, I have laughed enough at this picture for the both of us! On the eve of New York Fashion Week, Beverly Johnson and over 300 of her friends gathered at the Museum of the City of New York for a celebration of the life and memoirs of the accomplished supermodel. Johnson, whose Vogue cover in August of 1974 broke grounds and opened doors for models of color in the US and abroad, graciously hosted and mingled with the impressive crowd of entertainers, fashionistas, executives and die-hard fans at the stunningly decorated venue, which boasted signature cocktails and tasty bites over two floors. The star-studded gala, attended by the likes of Clive Davis, Mikki Taylor, Cheryl Lee Ralph, CeCe Peniston and more was quite the family affair; she was flanked by her daughter and best friend during her note of thanks, a short speech was also given by her long-term partner and we were treated to a musical performance by her nephew! When I wasn’t fangirling it out I did take a few pictures, so check out the rest below. 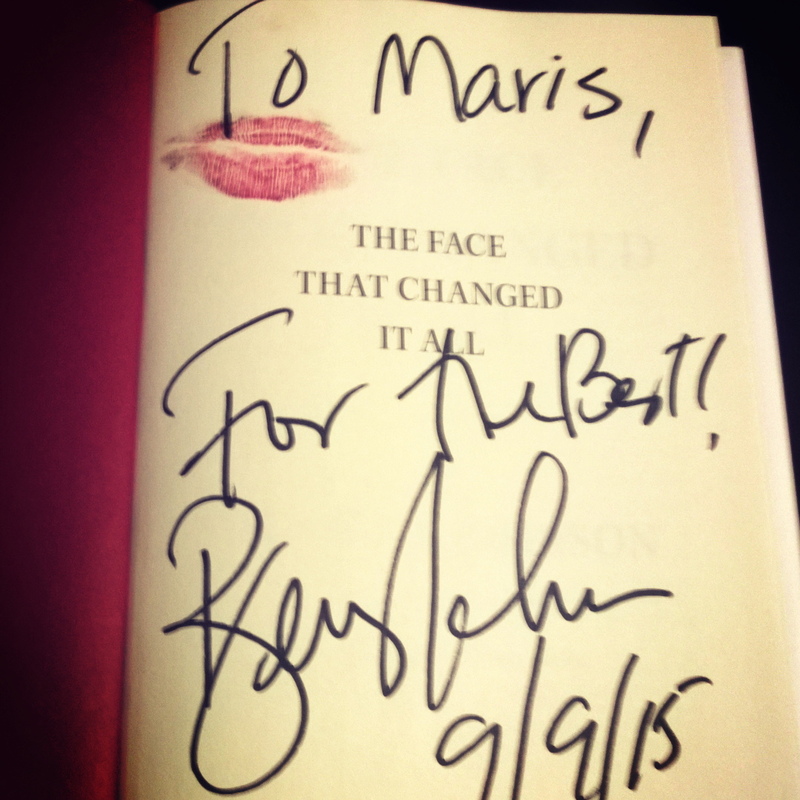 And you can get your own copy of Beverly’s “The Face that Changed it All” on Amazon. Here’s to a fun fashion week! The evening’s decorations paired well against the museum installations. Fans brought their own signature style to the event! Over 300 people attended the star-studded gala. 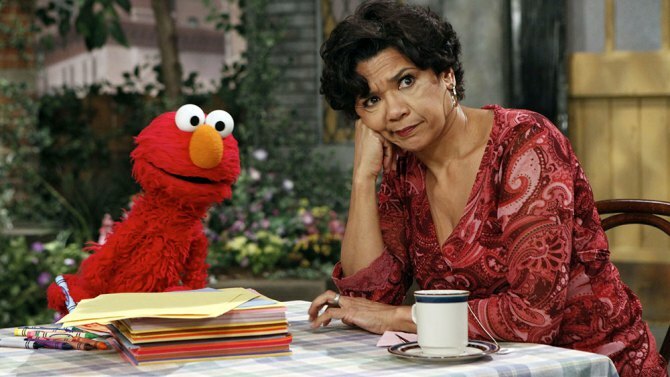 Sonia Manzano, or “Maria” as most of us know, is retiring after 44 years on Sesame Street. @nickmoreau @sesamestreet But the beginning of new endeavors! Many fans have had the honor of growing up with Maria, as Manzano weaved her own life into the character. Her real-life pregnancy was written in the show, even going so far as to explain breastfeeding in one episode. Viewers saw Maria date, marry, become a mother and a business owner, all while singing along with their favorite puppets. Sonia’s memoir, “Becoming Maria: Love and Chaos in the South Bronx,” is slated for release later this year, and I’m certain this is just the beginning of what will be an exciting new chapter. I’m certain she’s not done giving us life lessons, and I wish her the best!